The funny thing about my involvement with D&D is that it was actually mother who brought the Holmes basic set into our house. She bought a copy for my father sometime in 1979, because he'd been talking about Dungeons & Dragons a lot. My Dad has always been an avid reader and I suspect he must have read stories about it in newspapers or magazines. It's possible, given the timeline, that his interest in the game might have been sparked by the disappearance of James Dallas Egbert III in August of that year, but I'm honestly not sure. What I know for certain is that my mother bought a copy of the boxed set, which my Dad never opened, and which was then placed in the upstairs linen closet for several months. I knew the game was there, but never took much interest in it myself. That is, until Christmas when my friend Mike received a copy of a board game called Dungeon! Back in those days, it was tradition among my friends to spend our Christmas vacation making the rounds at each others' houses, showing off the presents we'd received and pronouncing judgment over which of all the gifts were the best. 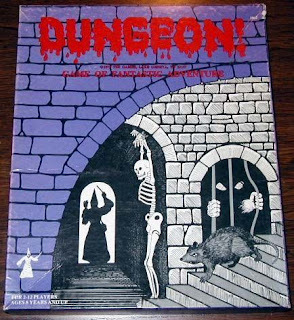 That year, without question, the winner was Dungeon! We played it many, many times and we all agreed that Mike was the victor in that year's "competition." What clinched it for us were the monster cards, which included all sorts of bizarre creatures we'd never heard of before, such as a "black pudding." We found the whole thing faintly ridiculous, honestly, but that very ridiculousness kept us coming back for more and, like some kind of narcotic, we wanted more. That's when I remembered the Holmes set in the linen closet, which I then took out and unwrapped. I gleefully took the book over to Mike's house to show it off and we then attempted to figure out how to play the damned thing. I'm not ashamed to say that we failed utterly in our attempts -- not that that stopped us from "playing" Dungeons & Dragons anyway. Our early adventures were weird things. We used Dungeon! to "clarify" things we didn't understand in Holmes and, because my boxed set didn't include polyhedrals, we played with only six-sided dice. I even have a dim recollection of using the board game's playing surface -- it wasn't really a board -- to run an adventure or two. Eventually, Mike's older brother, who was a surly teen metal head saw us with the Holmes rule book and listened to our feeble attempts to play the game. He'd never take much interest in us before, except perhaps to terrorize us with his loud music or to punch Mike when he "got out of line." When he saw us with the D&D book, though, he took some measure of pity on us and tried to help us -- in his own condescending way -- to play the game "properly." Of course, Mike's brother didn't play D&D by the book himself; he used lots of house rules and variants and so we adopted them as Gospel truths until we knew better. It was a strange turning point for us, because never before had Mike's brother ever treated us so nicely. He still beat up Mike, of course, but a bond, however tenuous, was forged through our mutual love of D&D. I bought the Monster Manual sometime in early 1980, using money I'd been given at Christmas. I ordered the book through the Sears catalog and was absolutely captivated -- and occasionally frightened -- by its contents. I vividly recall the illustration of the Night Hag being particularly unnerving to me. Over the next six months, my friends and I acquired other AD&D books and modules, which we used in conjunction with Holmes -- and then Moldvay when it came out the following year -- so we probably never played a "pure" version of the game, not that anyone cared. We were having the times of our young lives, creating characters with abandon -- you had to -- and inflicting all sorts of monstrous tricks and traps on one another. By popular acclaim, I quickly became the Dungeon Master. With the rare exceptions of when Mike's brother or father would run us through a dungeon, no one else really took to the role as I did and it's a role I've pretty much had most of my gaming career. I'm not a terrible player, mind you, but my unique "gifts" naturally incline me toward refereeing and so it has remained for the better part of two decades and more. I bought a copy of Dungeon! for myself at one point. It was a later TSR printing from the early 80s, with a proper board and sturdier components. I'm not sure I ever actually played it again. It languishes somewhere in my parents' basement, in much the same way as my father's copy of Holmes languished in the linen closet way back in 1979. Next time I visit, I should go and look for it. That game opened up a world of adventure for me; I think it's time I shared it with my children and see if lightning can strike twice. I gleefully took the book over to Mike's house to show it off and we then attempted to figure out how to play the damned thing. I'm not ashamed to say that we failed utterly in our attempts -- not that that stopped us from "playing" Dungeons & Dragons anyway. Our early adventures were weird things. We used Dungeon! to "clarify" things we didn't understand in Holmes and, because my boxed set didn't include polyhedrals, we played with only six-sided dice. By strange coincidence, this is the exact subject of yesterday's article on my blog. Exactly how do you play D&D? In the article, I suggest the idea of carefully documenting everything that happens at the game table of an old school campaign. I need to dig up my old Dungeon! board game. Perhaps that will get my newbie players into the proper mindset. Awesome entry, and probably your best one yet. Oddly enough, my first exposure to D&D was from the Holmes set, but I read in '88 or so. I didn't really get it, and tried to make it into a "Dungeon" style boardgame that I guess I could relate to better. Great story. A lot of it rings true for my first forays into D&D as well. My mother bought me a copy of the Basic Set after reading Mazes and Monsters, which explains a great deal about the general trajectory of my life. After? Mind you, that might have been why my mother bought it for my Dad, but then she didn't intend for me to wind up with it like I did. I'm also a graduate of the Holmes set. It showed up on the games shelf of our local drugstore of all places, along with the usual batch of Parker Bros. roll & move games. I spent several months staring at the back in fascination, trying to figure out what it was. My best theory was that it was some cousin of the Choose Your Own Adventure books that I was very fond of. When I finally got together the scratch to buy it, take it home, and rip off the shrink wrap, it was definitely not what I had expected, but it was terribly exciting nonetheless. My family was always big on games (chess & the aforementioned roll & move games), so I tried playing it with my parents, but for some reason they failed to get into the conceit of the game, so I put it away for awhile. But then I moved to a new school and made some friends to whom the concept appealed, so we rolled characters, headed off In Search Of The Unknown, and never looked back. Ahh, Holmes and Dungeon. I remember going to the hobby shop around the corner from our house and just stare in amazement as these bizarre products began to trickle in. The Holmes box cover was just amazing and I just stare at it in wonder, thus, Christmas '77 was all about D&D. Of course being only 10 years old I could barely comprehend the rules but rolling characters and killing monsters I under stood. The whole concept of 'turns' threw me off and I kept relating it to board games. We ended up playing the game totally wrong for about 6 months until we played in an introductory game at the hobby shop (they actually let us little kids play) and it was a whole different world and the whole concept 'clicked' Played the Dungeon board game too around that time and Boot Hill, Top Secret and a bunch of Steve Jackson pocket games. It was all about gaming and having fun those first few years. Holmes has always been my favorite. She has an odd sense of humor. She would've been a great OD&D referee. I have a huge soft spot for it as well. Some of it is nostalgia, of course, but a lot of it has to do with the combination of compactness and suggestiveness in that rulebook. It's shorter than Moldvay's version and, for my money, is far more inspirational.